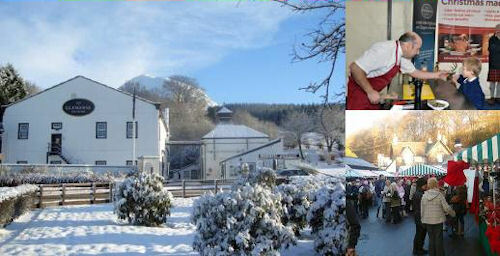 Date: Saturday, 4 December 2010 – 10.30 a.m. – 4.30 p.m.
Dumgoyne, 27 October 2010; Glengoyne, Scotland’s most beautiful distillery, is pleased to announce that the second GLENGOYNE CHRISTMAS FOOD & WHISKY FESTIVAL will take place on SATURDAY 4th DECEMBER 2010. This Christmas event with local, like-minded food and drink partners will showcase the best SLOW produce from the area at the home of the SLOWEST distilled Scotch whisky. Open from 10.30am – 4.30pm it will be a fun day aimed at all ages. In addition to food stalls there will be a range of unusual gift ideas and plenty of activities for all the family. Distillery tours and tastings will be on offer as well as wonderful food from renowned local chef, TOM LEWIS of MONACHYLE MHOR and his team at MHORfish and MHORbread. Glasgow’s DELIZIQUE and local favourites EDNMILL FARM SHOP will be among a host of other names. For the children there will be story-telling, face painting and of course Santa’s Log Cabin – by the foot of the distillery waterfall at the end of a magical glen. Building on the success of the 2008 event, Glengoyne have added a number of new initiatives, including a much wider range of food for consumption on the day, additional food and gift stalls, a farmers market, in-depth, one-off super-tastings to showcase the rarest and finest Glengoyne whisky, wandering minstrels, free wine, curry and MHOR master classes, additional heated areas, indoor parking, cooper racing (barrels, not cars) and, of course, a random fire engine. Stuart Hendry, Brand and Development Manager for Glengoyne commented: “We’ve made a number of improvements this year, but been careful not to lose the unique atmosphere in the distillery courtyard which brought that elusive feeling of Christmas’s past. There was something magical about the last festival and it is important to keep hold of that. “This year’s Festival will also see the launch of very special micro-release which will give whisky fans a unique insight into the maturation process. This ground breaking approach will appeal to whisky collectors and consumers alike. Further details to follow mid November. Booking for the distillery tours is recommended - contact: 01360 550 229.